This is one of a series of posts during the month of May, during which time the Harmon family has vowed not to consume any sweeteners, natural or refined. We call the challenge “Beyond Sugar” and would love to have you join us, in whatever way you feel led! 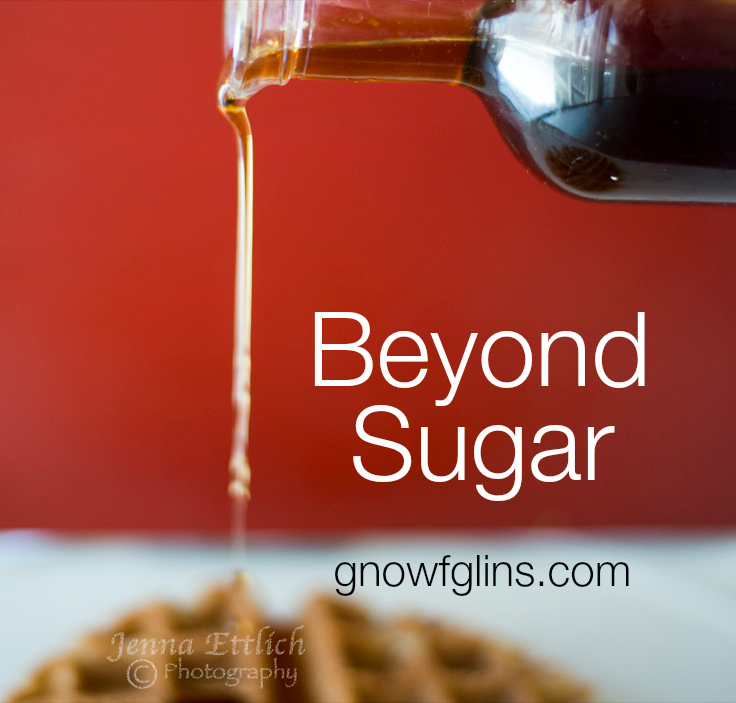 Today, I want to talk about a big challenge my family faces in going Beyond Sugar – snacks. What to eat when we're used to turning to a cookie, or muffin, or dried fruit? I will need your help on this, for sure! I'm discouraging consumption of dried fruit since it is concentrated fruit sugar, which can have a similar effect as a concentrated natural or refined sweetener. Here are some ideas that I've been jotting down the last few days. The bonus is that now we're coming up on warm weather, many of these are wonderful as part of light meals on hot days. Spelt Biscuits with natural peanut butter or almond butter – Yesterday, B. made these biscuits all by herself; they're delicious, easy, and quick! Fresh, whole fruit – waiting for more to come in season! Veggies – waiting for more to come in season! What would you add to this list? What not-sweet snacks foods are your family's favorites? We love hummus! We use pita bread, carrot sticks and in the summer bell peppers to dip. i drink rooibos teas. also called red bush, african tea. it is not a true tea plant so it is naturally non-cafeinated. it is very similar to tea but i like it much better. there is no bitter black tea aftertaste, so it really doesnt need any sweetening! it used to be hard to find but is now available in most grocery stores. azure carries a loose leaf rooibos with lemon myrtle that is fantastic as an iced sun tea. also, i wll soak raw almonds overnight and let them sit to sprout just a few hours then rinse and dehydrate for 1/2 an hour. when they are a little dryier i will add just the tiniest bit of red palm oil (maybe 2 teaspoons for 4 cups almonds?) and a tablespoon or more (a lot falls off) of seasalt or especially a salish (smoked) salt. then dehydrate fully til crunchy. these make a delicious snack! you can use other spices as well, of course and the oil makes them stick nicely and gives an almost roasted flavor but still only heated 105 degrees. keep them refridgerated for freshness and crunch. Jessica — I forgot about hummus! How could I? That’s a fabulous non-sugar snack and is definitely going on the list! 1. Sprouted grain bread with a sugarless bruschetta. Yum! 2. Brown rice cakes with my stevia-sweetened homemade nutella! Yum! 3. Vegan breakfast cookies. They have molasses. Is that too much? These cookies sound so good! Does everything go into the food processor or just the banana and apple sauce? Plus must they be microwaved before eating? Thank you. Gilliebean – Those look very good! They have hardly any molasses in them. Thanks for the other ideas, too. Where’s your nutella recipe? I’d like to try it! I can’t believe that I hadn’t replied to this! Here’s my nutella recipe! Enjoy! It has lots of healthy -and not sugary snacks. Thanks, Lisa – Your site looks good! gilliebean — yumm, yumm, yumm! Thanks! Oh, look! I *had* replied! Oops! Something that I like to snack on, because it is both crunchy and flavorful is raw sweet potato. I like homemade yogurt with homemade applesauce – heavy on the cinnamon but no sugar. You can make the sauce with skins on to keep the fiber; just whir them in the blender to make it fine and not full of skin pieces. Even if you don’t like the tang of plain yogurt, this one is doable! Katie – I think we would really like this. Thank you! That’s just how I do apple sauce or pear sauce, in the Vitamix, still with skin (of course, they are naturally grown). Would be yummy with homemade yogurt. If you add almond meal to your yogurt, applesauce and cinnamon, it tastes just like apple pie with icecream 😛 My boys both love this for a snack/dessert (I’ve been known to eat it for breakfast too)! Thanks for the great ideas! We’re specifically cutting out sugar AND carbs for a while, and I run out of fresh ideas pretty quickly. Heya! I have a serious sweet tooth and I’m always trying to figure out why I’m craving sweets. I’ve learned that the major reasons I crave sweets are 1. I’m dehydrated, 2. I’m HUNGRY!! !, 3. I need protein, 4. I’m tired. When I was pregnant my midwife told me to reach for protein whenever I craved sweets and refined carbs, and I’ve kept following that advice. And staying hydrated and well rested and generally well fed are basically all fab preventative measures for staying out of the sweets for me. So more of a lifestyle thing then a specific food thing. I think this list needs updated (lengthened)….. 🙂 Just sayin’…. I bet there are more traditional foods to be included here, that would be helpful for us beginners. The list could be endless! 🙂 There are several good suggestions here in the comments.